need. It`s perfect for extended families and reunions. Enjoy the fully heated pool and hot tub in the huge two-story screened enclosure - great for relaxing! One problem. You won`t want to go home! Upstairs features three bedrooms and two baths (1800 sq ft), huge living room with 60" flatscreen TV, sofa sleeper and two sitting areas. Dining room has seating for eight. Outdoor screened porches off the living room are great for morning coffee, dining and relaxing. A romantic king-size master has ensuite bath with separate sink area. Queen size and twin bedrooms in a separate hallway share a spacious second bathroom. Downstairs, a separate two bedroom Guest Apartment on the ground floor provides accessible living with queen-size and twin bedrooms, and a full bath. Separate TV, kitchen, and laundry. Please note there is no interior connection. Lots of pool and beach toys, towels, beach chairs. outdoor furniture. Sun Castle is at 128 Bay Mar Drive in the 3600 block of Estero, 10 blocks North of Publix. 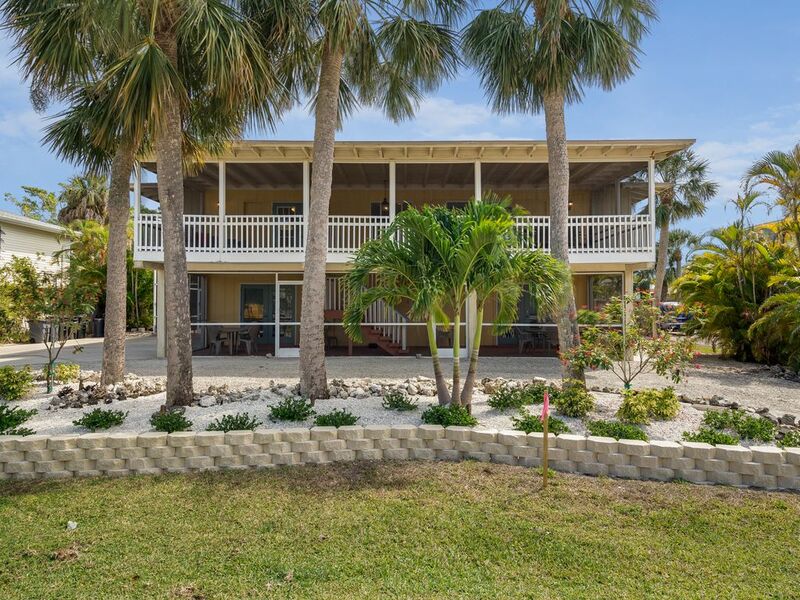 Sun Palace Vacations is a family owner, nationally accredited vacation rental management company listing homes and cottages exclusively on Fort Myers Beach. We live, work and play here. This was the first vacation home that we bought on Fort Myers Beach. W loved the solid, well built house with great decks across the front and a terrific family feel. Great Mid Island location just 8 blocks north of Publix grocery store. The home had plenty of room for our family and grandchildren. Nicely furnished. The pool is rather small but is plenty big enough for the grandchildren to splash around. The adults enjoyed the hot tub. The house is located on a very nice, quiet street. Note though that the island's main road (Estero Blvd) is currently undergoing major construction so expect lengthy traffic delays during the day and on weekends. During busy traffic times, forget about making any quick trips to the local market. To access the beach, we typically drove our car the short distance to public beach access. There typically is metered parking ($3 per hour) at beach access parking lots. Nice roomy house with amenities. The pool and hot tub are very nice. Kitchen is well equipped to make meals. We rented a car so we could drive to the beach. It’s just a little too far to walk. We had a great time. There are a few minor repairs that would be nice. Great place with everything we needed! Thanks so much Beth, glad you all had a great time!